How many of you never quite seem to get enough Magic: the Gathering under the tree each year? As some of you know this past week Ertai’s Lament hit a major milestone- half a million views since we began! And so we present our latest giveaway. We’re absolutely delighted at the support we’ve received from the Preconstructed Community, and for this holiday season to celebrate we’re giving something back. This season, we’ve put together a Christmas Care Package full of precon goodies you’ll be sure to enjoy. We don’t want to ruin the surprise, but we’re giving away a trio of Theme Decks- including one from Urza Block! There’s also an Intro Pack from a newer set, an Ultra-Pro official deck box, and a limited edition Magic: the Gathering t-shirt- the kind you could only grab at Magic Celebration if you plunked down for a Deckbuilder’s Toolkit. And hey, we’ll throw in a half-dozen Fat pack deck boxes while we’re at it. Some quick fine print before we get to the good stuff. One of the theme decks is open- we snared it new at the Wellfleet Flea Market on our vacation in case anyone wanted to play, only to find out when we got home we already owned it. Another one has the box opened but the deck is still pristine and shrinkwrapped, as that’s how it was when we bought it. Everything else is shiny and new. 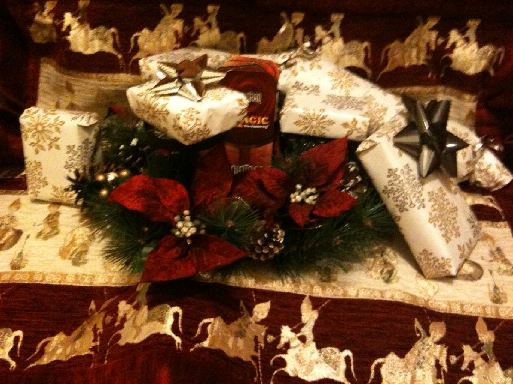 And I wrapped the gifts, not Jimi, so you know who to laugh at! Also… we’ll be sending out a message tomorrow on Twitter announcing the contest. Just retweet it for an extra chance to win! The deadline for entry is 6:00pm (EST) on Thursday, 15 December. We’ll be picking a winner that very evening, in the hopes that we can get their address and send Santa on his way so that it arrives before Christmas does. We’ll randomly select one commentor from each of the eight review articles (it might be the same person more than once, since leaving additional comments increases your chance of being picked) and put their names in a hat. Then we’ll pick a random name from the Twitter re-tweeters and put their name in a hat, and then draw our grand prize winner from those nine. Again, you don’t have to leave a comment on every Kamigawa article to win- but it certainly helps your chances! Good luck to everyone, and we hope you will enjoy our visit to the land of Kamigawa, as well as the upcoming holiday season. As always, thanks for reading! By far one of my favorite sets. Sweet giveaway! I’m excited! I know for sure I’ll be rolling to try and get some generous loot! Sounds cool! I suggest adding a limit to the number of entries per article; that’s just asking for spam, haha. ah, my favorite block at last. I’d second Werekill’s motion for some sort of spam control, although I don’t recall that being much of a problem in the past. Thanks so much for doing this=] Looking forward to the reviews. Indeed, Thanks for the contest. Thanks for starting this contest, it encouraged me to start commenting and playing with more precons. The Kamigawa theme decks were… Well l, underpowered to say the least, with one notorious exception: Rat’s Nest. I personally bought no less than 20 or 30 copies of east nests, and traded many, many Umezawa’s Jitte during that time. I also, (no surprise) have something like 60 Throat Slitters lying around.